I finally managed to put everything away after retreat this weekend. 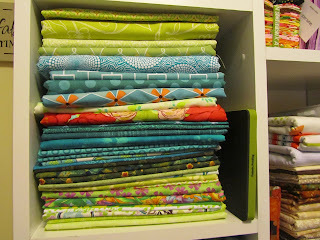 My house might not be the most organized, but I hate it when my quilting room isn't organized. The thing that took the most time... putting away all of this fabric that I got at Marden's on my way home from retreat. Marden's sells salvage fabrics. The fabrics are quilt store quality fabrics (well, the one's that I got, some might be more Joann's quality) and have no issues. 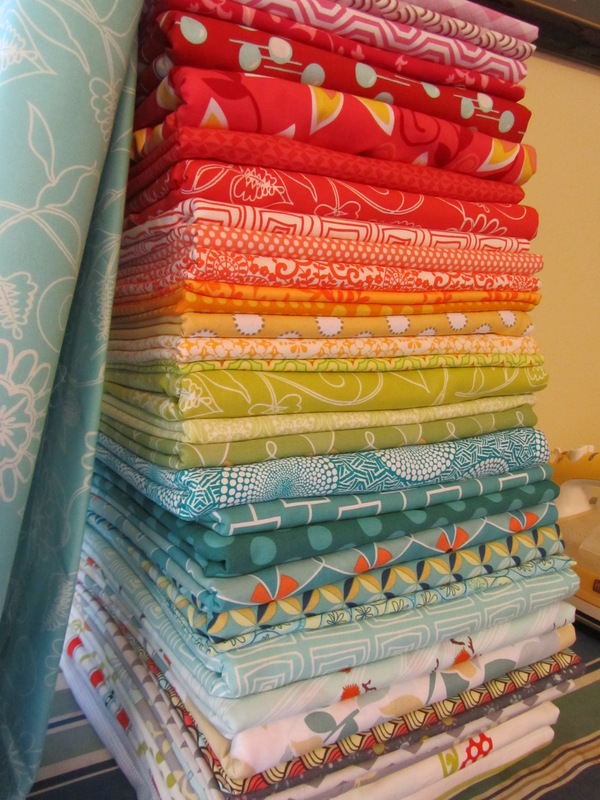 No fabric is more than $4.99, which is awesome for quilt store, designer fabrics. In addition, they are very generous when they cut their fabrics. I measured, and all of my 2 yard cuts were at least 2.25 yards with most being 2.5 yards. My 3 yard cuts were all at least 3.5 yards with most being 3.75 yards. I calculated it out that with what I paid and the fabric that I purchased, it worked out to $3.80 a yard! And that's for quilt store quality fabrics. I'm talking Westminster, Free Spirit, Henry Glass, Studio E, etc. After putting all of my fabric away, this is what my fabric shelf looks like! 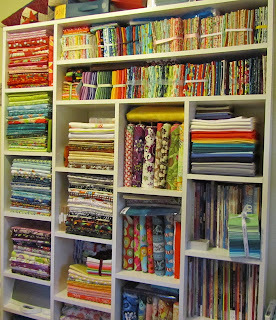 My fabric is organized by color, by fabric line and by fabric type. 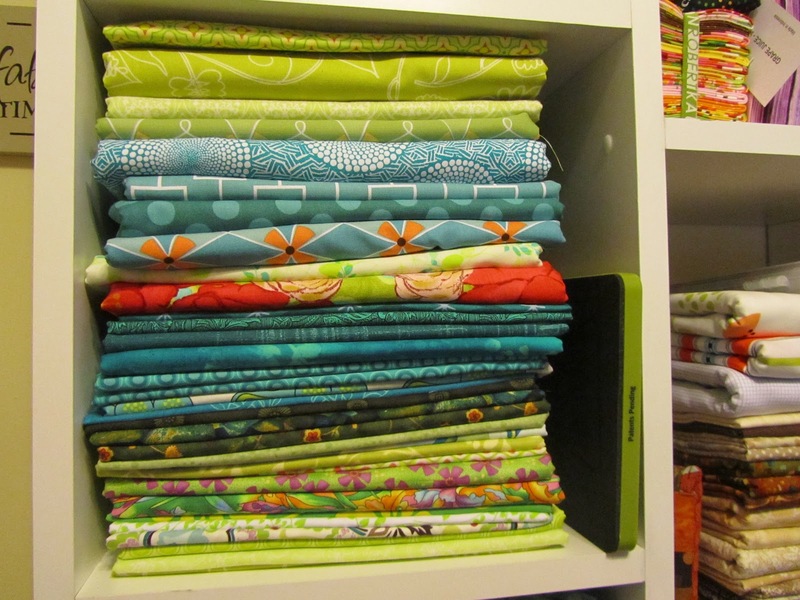 I have one section for my solids, one for my batiks, and the rest for designer cottons. I have two spaces for books and two spaces for my fat quarters. 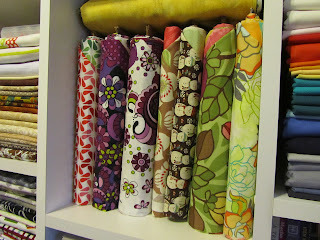 I organize fabric that's more than a yard in length two ways. For fabric that is just going in my stash, I wrap it around a 9" ruler and then fold it in half. I them place it into a cubbie by color. This is my green/teal cubbie. If I have more than two 1+ yard pieces of fabric from the same fabric line, I wrap them around a mini bolt to keep the line together. I used to use pieces of cardboard before I got the plastic mini bolts for Christmas last year. Phew, now that I'm all organized I can get back to being creative. 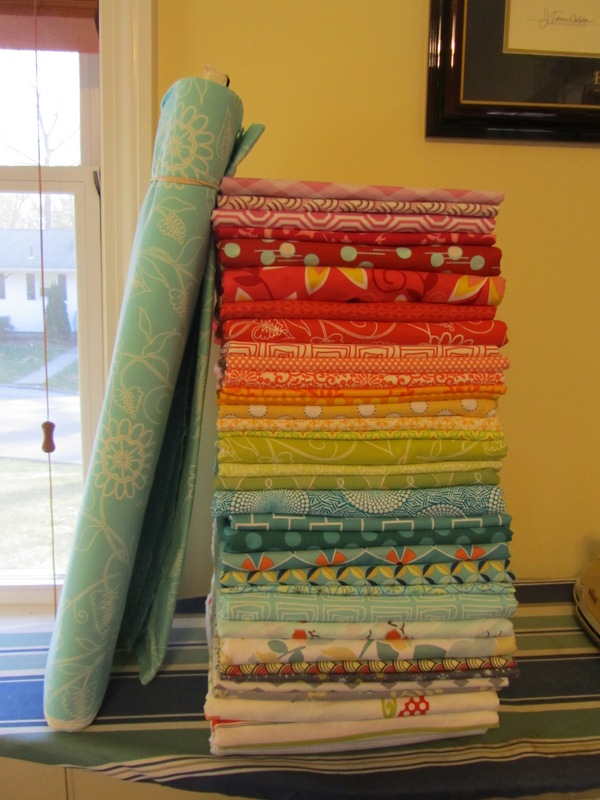 I finished the quilt top for the Paper Pieced Pattern-A-Day Garden Party Blog Hop that I'm participating in next month. (phew, that's a mouth full) I get to share that with you on April 26th. I can tell you that I've been inspired by the early spring we've been having here in Massachusetts and the flowers popping up are my inspiration. 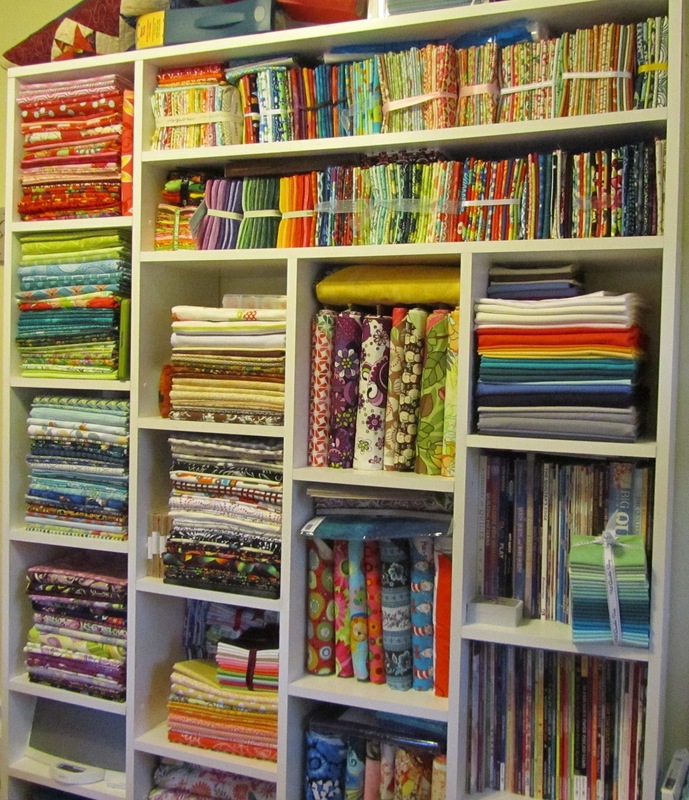 even your fabric shelf is a work of art! !